If you read The Stream regularly, you’ve waded through tens of thousands of words that aim to explain what we’re up against. The power of social media to censor and silence. The corruption of our courts. The completely unearned sense of superiority which ignorant, sneering 20-year-olds display toward seasoned believers. The slow-motion train wreck of the Democratic Party, which has ceased to be a patriotic or even a sane organization. The rise of a new, inquisitorial religion, which worships a flittering shadow called “social justice.” The slow grind of laws meant to persecute our faith. I write about these topics five days a week, every week of the year. (At about 1,000 words per column, that’s a 250,000 words I write per year — the length of four decent-sized books.) It sometimes feels like I’m fighting a swarm of wasps. Because those who hate Christianity, the nation it helped to make, and the civilization it built, are tireless. They never stop. Let’s say we find an honest court that debunks one cobbled together attack upon our freedoms. They shop for another venue, and relaunch the same offensive. We rouse ourselves to repeal some profoundly evil policy of the government’s. So our enemies cozen or bully massive corporations to impose it on us instead. It. Is. Relentless. If you’ve ever watched a movie depicting an exorcism, you’ll see the resemblance. The spirit tries to wear down the priest by every possible means. He’ll lure him into subtle logical games. If that doesn’t work, he’ll batter him with profanity. Threaten his life. His congregation, his family. Then back to mind-games again. Or else mere grinding repetition of the same obscene phrase, over and over again. You know, like those Tweets from Planned Parenthood that say “Abortion is health care” sixty times, interspersed with little smiley faces or idiotically clapping hands. 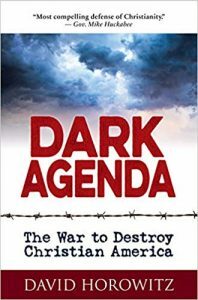 Horowitz exposes in fewer than 200 pages the motivations, analyzes the strategies, and dismantles the logic of anti-Christian campaigns. He shows, not incidentally, why those who fight hardest to erase every trace of Christian culture also usually hate the Jews. And America, from its free economy to its culture and Constitution. In the midst of this storm of squalor, it’s helpful when someone steps in and blows a whistle. Or rather sounds a foghorn that parts the roiling miasma, so you see what’s going on. For that we must thank David Horowitz. 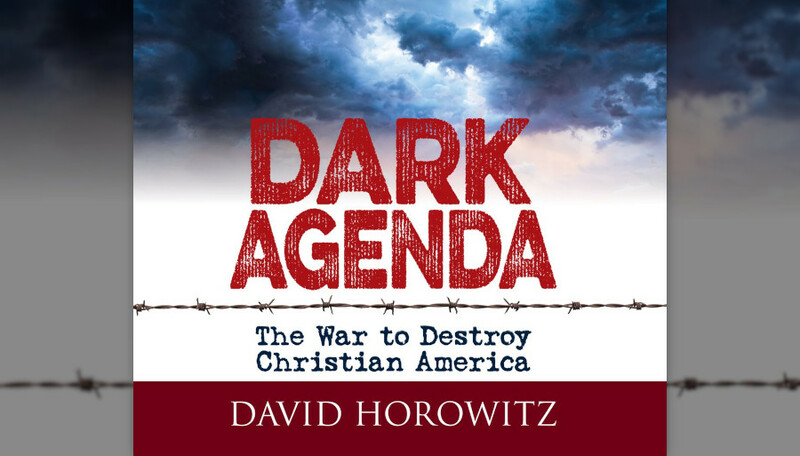 In his new book Dark Agenda: The War to Destroy Christian America, Horowitz manages something amazing. He exposes in fewer than 200 pages the motivations, strategies, and logic of anti-Christian campaigns. He shows, not incidentally, why those who fight hardest to erase every trace of Christian culture also usually hate the Jews. And America, from its free economy to its culture and Constitution. Those things stand bound up together, you see. America, at its best, was governed by reason and knitted together by faith. It avoided both the thuggish coercion of theocracy, and the vapidness of secularism. It proved, to the blank astonishment of clerical conservatives and godless philosophes alike, that liberty and virtue could be compatible. That they could together thrive, in a kind of celestial dance. In fact, you could map the checks and balances of our magnificent Constitution in just that way. That document and the institutions that birthed it and cherished it (from town meetings to churches, civic clubs to moral crusades) compelled Americans to dance with each other. No one could get away with pushing too hard, or corralling everyone on the dance floor to goosestep in one direction. And the outcome was often … beautiful. But not to everyone. As Horowitz knows, and tells us. He grew up in a family that was loyal to Stalinist Russia. His family rejected the religious core of Judaism. Like so many millions, Jewish and gentile, his family found a messianic hope in this world, not sent by God but cobbled together by human efforts. And imposed upon hundreds of millions at the point of a bayonet. Horowitz recounts here briefly (as he has elsewhere at great length and depth) what it feels like to worship that idol. And the shocking, violent experiences that goaded him to abandon it. Horowitz grew from a cocksure, anti-Christian atheist and Communist to a bemused, respectful agnostic who admits to being jealous of those with the gift of faith. His attitude toward Christian institutions and culture (which have often been intolerant and imperfect) is now generous and charitable. It shows that within this culture warrior beats a warm and benevolent heart. Horowitz explains in detail why “progressives” have come to hate Christianity, the State of Israel, the market economy, and the free play of different ideas. They have adopted an intolerant and brittle false religion. It’s not quite Marxism anymore — that system is too rigorous, and has anyway been comprehensively refuted by events. It’s a sort of free-floating cynical scorn of pretty much everything as it really exists, compared to a fuzzy, emotive sense of how things ought to be — once you toss out the window every constraint of what it would cost. Not in money (though of course, like Alexandria Ocasio-Cortez, they wave that question away). In freedom. And human spontaneity. In genuine diversity, which isn’t skin deep, but twinkles, deep down in the brain.